PennsylvAsia: 2017 Japanese animated film Mary and the Witch's Flower (メアリと魔女の花) coming to Row House Cinema, too. 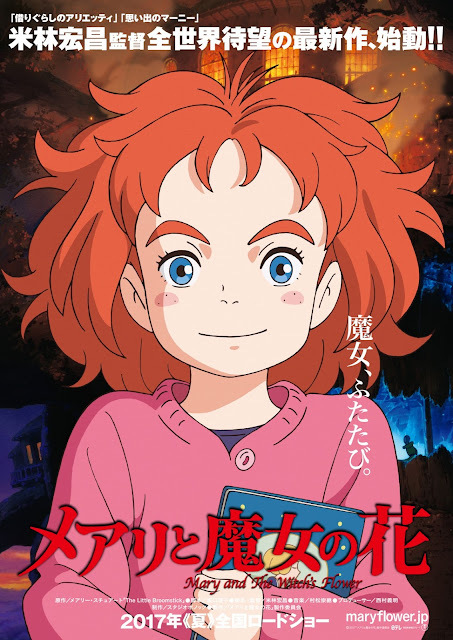 2017 Japanese animated film Mary and the Witch's Flower (メアリと魔女の花) coming to Row House Cinema, too. The 2017 Japanese animated film Mary and the Witch's Flower (メアリと魔女の花), scheduled to play at Pittsburgh-area Cinemark theaters on January 18, 2018, will also play at the Row House Cinema as part of it's New Animated Films series from January 19 through 25. Fathom Events and GKIDS are proud to present this special one-night premiere event of Studio Ponoc's debut film by Academy Award®-nominated director Hiromasa Yonebayashi, director of Studio Ghibli’s When Marnie Was There and The Secret World of Arrietty, and an animator on Spirited Away, Howl’s Moving Castle, and more. Mary and The Witch’s Flower is an all-ages action fantasy adventure full of ingenious characters, jaw-dropping imaginative worlds, and the simple, heartfelt story of a young girl trying to find her place in the world. Ticket and showtime information for the Row House Cinema screenings are not yet available. Tickets for both the dubbed and subtitled versions are currently available online. Pittsburgh-area Cienmark theaters showing the film are Monaca, Monroeville, North Hills, and Pittsburgh Mills.